I took the train to London earlier this week and shared the first part of my journey with a very unusual individual. I don’t know his name, I don’t know where he came from and I don’t know where he was going. But I very much doubt that I’ll ever forget his face. And I certainly won’t forget the day that I travelled with a bear. When I first saw him, he was perched on the bench on the station concourse. His dark eyes were fixed straight ahead, as if in an attempt to avoid the stares of his fellow passengers. His companion, a furtive teenager in trendy clothes and a baseball cap, was immersed in his phone. There was something admirable, I felt, about the way the youth was able to project an aura of normality, as if hanging out with a bear is just what one does on a Monday morning. 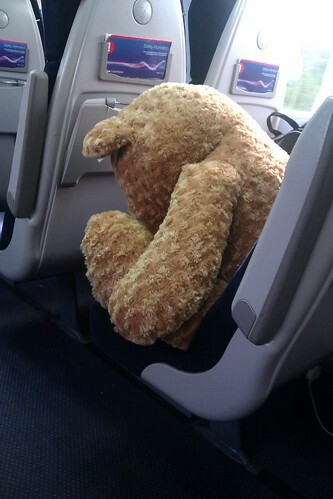 On board the train, I managed to nab a seat near the bear. I didn’t want to sit too close, as bears are notoriously volatile travellers, but I needed to know more. At first, I thought I was perhaps the only person in the carriage who could see him, as everyone else just walked on by as if nothing was amiss. Even the conductor checked the teenager’s ticket without a word*. But as he continued on his rounds he grinned to himself and let out a slight chuckle, so I knew that it wasn’t just me. Sadly, after just one stop, the bear and his companion alighted from the train and disappeared into the crowd. I tried to watch where they were headed, but soon lost them in the melee of the morning rush hour. Where were they going? What were they doing? Would our paths cross again? It seems I’ll never know. But I certainly won’t forget the day that I travelled with a bear. * The bear, you will be pleased to note, travelled for free. This entry was posted in Photography, Travel and tagged Bears, Photography, Train, Travel, Weird stuff that happens to me by Simon Perks. Bookmark the permalink.